Gina is the Chief Financial Officer for All Panel Systems, LLC. She is a CPA who has spent fifteen years in public accounting. Gina graduated from Southern Connecticut State University with a BS in Accounting. 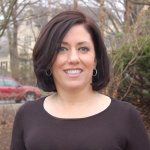 Gina is active in the St. Thomas’s Day School community where she has served as Treasurer on the PTO Executive Committee for the past five years. In addition, she chaired the PTO Nominating Committee, co-chaired the Mom’s Night Out Committee, and she was a member of the Gala Committee. Gina and her husband, Lou, reside in North Haven. They have two sons, Louis (Class of 18) and Nicholas (Class of 2016), who have attended St. Thomas’s Day School since Junior Kindergarten. Gina and Lou are active members in their parish, St. Barnabas Church, and in the North Haven community. Gina and Lou are committed to raising funds for the American Lung Association’s annual Fight For Air Climb-New Haven.